The possible has been tried and failed. MythoFutuRiddim [mytha-foocha-riddim] is an annual, self-funded pop-up exhibition featuring emerging artists and musicians who explore ritual, cultural mythology, Afrofuturism and constructed identity. Our inaugural exhibition took place on July 13, 14, and 15 in Bushwick, Brooklyn. Our collective goal is to build a sustainable yet profitable career model for artists by promoting self-funded exhibitions that develop direct connections between emerging artists and emerging collectors. By curating, hosting, promoting and funding our own shows we hope to actively develop and maintain our creative careers on our own terms. Originally from Chicago, Harlan Ballogg moved to New York in 2013 to study Illustration at the School of Visual Arts. After obtaining a BFA degree, Harlan remained in New York to begin developing a body of paintings. His work often depicts portraits of people of color and those who have been marginalized by general society. The portraits serve as a direct response to art history’s habit of whitewashed portraiture. Raised in the South Bronx, Bree Person is a double-major in Anthropology and Media Society at Purchase College. Using her lifelong passion for Art and construction, Bree has taught herself to build the things she wants to see and experience. Bree’s installation “Urban Renewal”, hopes to bring awareness to individuals living in the city projects who are disenfranchised and socially stigmatized. Wi-Moto Nyoka is invested in how the qualities of cinematography can be fused with live performance, as well as how film and episodic/web narratives can be deepened with corresponding live performances and immersive installations. Her primary means of exploring this is through diasporic narratives in film, theater and music. Her artistic goals are to continue to create hybrid performance projects with artists around the world. As an artist, designer and curator I’m interested in the exploration of futurist themes and often explore ways in which technological innovation is changing the landscape of art and culture. I’m interested in how conflict can help foster creative opportunities for dialogue across themes, genres, mediums and diverse art making methods. This melange of ideas and concepts spearheaded the creation of MythoFutuRiddim [mytha-foocha-riddim], which features work and performances that explore ritual, cultural mythology, Afrofuturism and constructed identity. The aim of the exhibition is to examine the underlying complexities inherit in making work that deciphers the African Diaspora experience. One aspect of Afrofuturism is that it explores the developing intersection of African Diaspora culture with an examination of past histories and future possibilities. 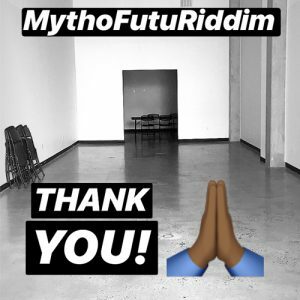 MythofutuRiddim, an as extension of Afrofuturism, moves through that intersection to explore how Art is influenced by Cultural Mythology, Futurism, and Riddim/music. After months of planning, staging day finally arrived. Friday, July 13 marked the opening of MythoFutuRiddim. It was our lucky day. I arrived at the gallery at 9am, immediately lit some sage and jasmine incense and got to work installing the show. Artist, Dave Eppley helped with the latex signage installation on the front glass windows of the gallery. Some skate kids slipped in while I stepped out for a break and were actually the first official visitors to MythoFutuRiddim. I took a photo of them and later realized one of them had snatched a warm Corona from the twelve-pack that I hadn’t yet put on ice (lol). I met PIXEL the Artist for the first time, as she had traveled from Florida. Wi-Moto Nyoka did a lovely performance of Hair Did, a durational performance-art piece that explores the matriarchal tradition of hair braiding within the African Diaspora. It was so inspiring to see the show materialize and also to see so many new and familiar faces. Saturday July 14, the second day of MythoFutuRiddim started in the Dunkin Donuts on Nostrand and Eastern Parkway. Melinda had ordered coffee boxes and donut holes the day before, so there we were bright and early picking up the order. Some sanitation workers in neon green t-shirts and Staten Island accents were pissed that there breakfast sandwiches were taking so long. The clerks at Dunkin were scurrying around like ants. Once we got to the gallery, Melinda and Maya (mostly Melinda) set up breakfast for our morning event, MythoFutuRiddim is for the Kids! (MFIFTK). We re-organized the gallery a bit for the children and families, which arrived just after 10am. We gave out fresh packs of crayons, markers and an array of coloring sheets. We worked on a fundamentals of drawing/design lesson using PIXEL the Artist’s painting XXY Examination as an example as to how to recognize basic shapes when trying to draw. It was amazing to see the children as well as their parents involved in creating work and studying the work featured in MythoFutuRiddim. We got a surprise guest of appearance from the birdman himself, Winston the Hornsmith and had steady crowd of visitors throughout the afternoon and early evening. DJ Good Grief closed out the day with a Riddim set that began at 7 PM and lasted until 8 PM. July 15 marked the last day of the inaugural MythoFutuRiddim exhibition. We held an artists discussion around the fundamental aspects of the show; mythology, futurism and Riddim/music. The dialogue was healthy and inspirational. PIXEL the Artist hung out with some actual nuns. In our discussion, I learned that Wi-Moto is a big Janelle Monae fan (not surprising). Bree made some great points about predictive policing and the demographics of retail workers. DJ Good Grief listens to frequencies instead of actual “music” and Harlan is big fan early Chicago house. We hung out in the gallery with Sunday’s visitors discussing our work, networking, bullsh*ting, coloring, listening to music and brainstorming about Art. It was a bittersweet feeling to close the gallery on day three. But we’re very excited about our next iteration of MythoFutuRiddim which will feature a new roster of emerging artists who are exploring ritual, mythology, Afrofuturism and identity. We want to thank everyone for their communal support. See you for the next one! MythoFutuRiddim was supported with supplemental funds provided by 18 art patrons who donated $1906 dollars to our project. We list the names of the donor to show our immense thanks and gratitude. © 2019 A.C. Evans All Rights Reserved.